QUADRIVIUM is from Norway (I knew it!) and have been around since 2005, when Antonsen and Jensen decided to form a project that was intended to be only a quick affair consisting of a demo with two or three songs. As you know, god (the devil or whatever you prefer) works in mysterious ways and the band continued its journey in the Black Metal scene. Until now, they have released one EP in 2006, and this is their debut full-length work, under the wings of the Dutch Soulseller. The band tries to create a sound close to bands like LIMBONIC ART and EMPEROR, with twisted melodies and insane keyboards, and while listening to the first 2-3 songs I was kind of satisfied with the outcome. The fact is that when you listen to the whole album you realize that the band has some great composing skills but no fantasy at all. Every song has the same structure and the same style of riffing. 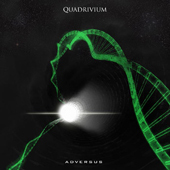 Even though QUADRIVIUM is a band with decent potential, they drown in their own void of monotony. I guess that if they manage to distance themselves from this guitar/keyboard based EMPEROR kind of Black Metal and work on producing a more original sound, they will definitely achieve to create much better music. They just need to enrich their riffs and make their songs a bit more diverse, if you know what I mean.